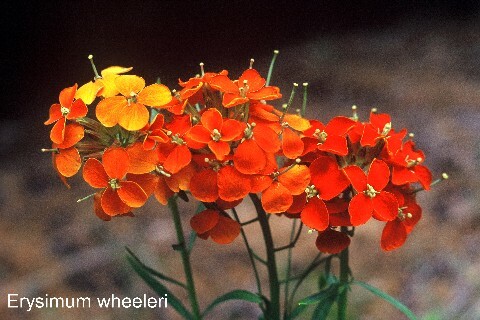 Erysimum jugicola (Brassicaceae) (10x16,Z5,P,L,3:6w) ............................................ 70 seeds / $3.50 50872.00 Heads of bright yellow flowers over lance-shaped, toothed leaves. 70896.08 Ex Ula Dag, Turkey, 2300m. Mustard-yellow flowers on stems about 12 inches tall. 32748.29 (W) Albany Co., WY, 10600ft, 3232m. Golden yellow flowers / yellow anthers here. 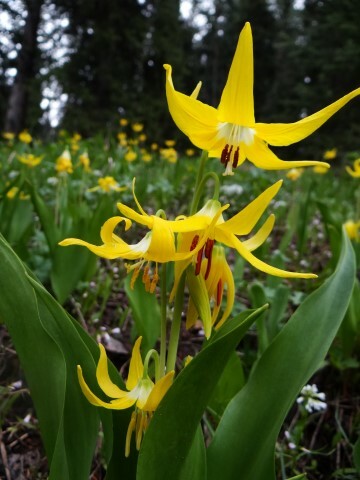 Erythronium grandiflorum (15x12,Z3,P,C,3:16w) ........................................................ 100 seeds / $4.00 32748.63 (W) Lewis and Clark Co., MT, 6350ft, 1936m. Flowers not seen here but are undoubtedly yellow. Anther color not known. 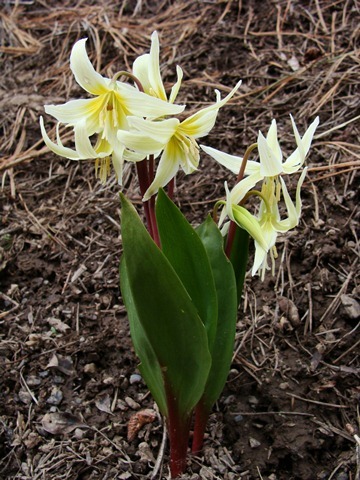 Erythronium grandiflorum ssp. chrysandrum (16x12,Z3,P,L,3:16w) .......................... 80 seeds / $4.00 33748.14 (W) Montrose Co., CO, 9160ft, 2793m. 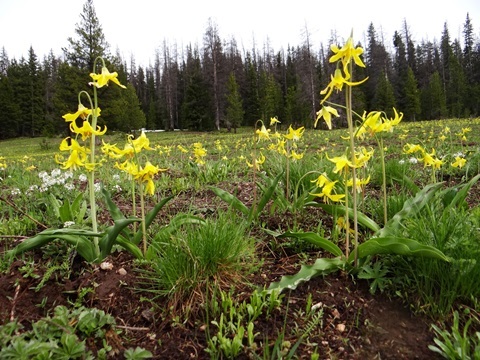 Bright yellow flowers with golden anthers here from a classic population on the Uncompahgre Plateau. Erythronium helenae (12x14,Z6,P,L,3:16w) .................................................................. 35 seeds / $5.00 35295.38 (W) Napa Co., CA, 1525ft, 465m. 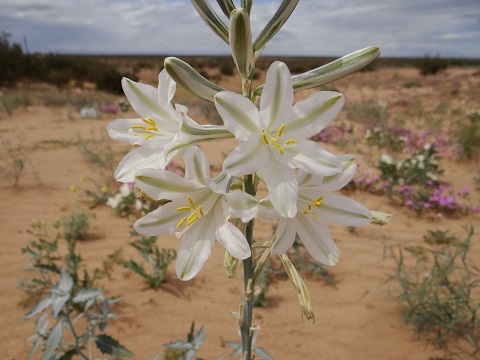 Lightly-mottled plants bear pure white flowers similar to E. californicum but with dark yellow anthers. Fades to pink with a yellow throat. On E-facing serpentine screes. 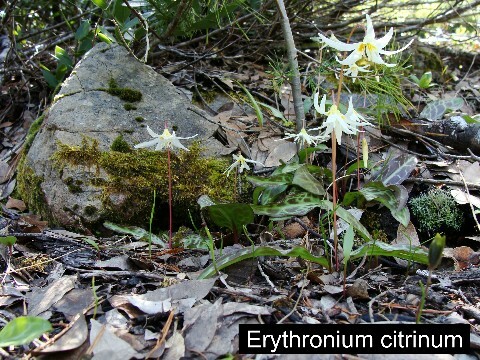 Erythronium purpurascens (24x10,Z5,P,L,3:16w) ......................................................... 100 seeds / $6.00 70915.53 (W) Nevada Co., CA, 7600ft, 2317m. 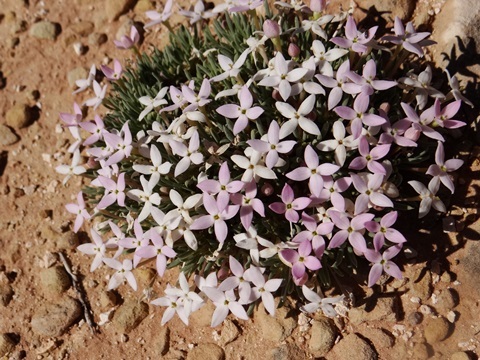 Several small creamy-white flowers with yellow bases and reflexed tepals are tiered on the scapes, aging to a pinkish-purple. Unmottled leaves. In the shade of Red Fir forests, here right at timberline. Erythronium tuolumnense (Liliaceae) (15x16,Z6,P,L,3:16w) ..................................... 70 seeds / $5.00 78869.36 (W) Tuolumne Co., CA, 3400ft, 1037m. 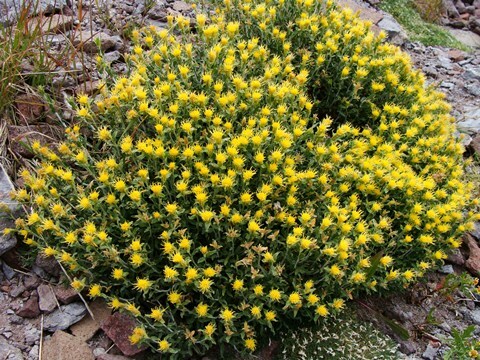 Bright yellow flowers are borne 2 or more per scape over green leaves with undulate margins. Prefers the deep shade of deciduous woodlands. Escobaria missouriensis (Cactaceae) (9x24,Z5,P,L,3:4w) .......................................... 25 seeds / $4.00 56516.35 (W) Sedgewick Co., KS, 2500ft. JRT3122 Multi-clumping type with straw-yellow flowers and dark mid-line stripes. Escobaria missouriensis v. similis (5x8,Z5b,P,L,3:4w) ................................................. 25 seeds / $4.00 56523.16 (W) Nolan Co., TX. JRT4142 A larger, more robust form with usually single stems, clumping with age. Light to dark gold flowers often with a hint of pink. Escobaria tuberculosa (17x19,Z6,P,GL,3:4w) ................................................................ 50 seeds / $3.00 78850.33 (W) Pecos Co., TX, 4100ft, 1250m. JRT4141 Cylindric, multi-clumping, grayish-spined stems. Nice white flowers with a hint of pink. Escobaria tuberculosa v. varicolor (15x5,Z6,P,GL,2) ................................................... 40 seeds / $3.00 78853.13 Ex Brewster Co., TX, (Thompson.) TC029 Single cylindric stems with semi-coarse, grayish-white spines. Flowers white with a hint of pink in rings at the top of the stem. 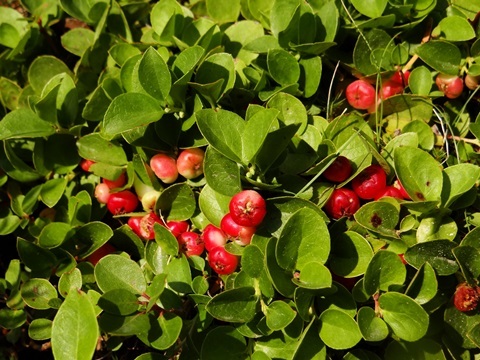 Bright red fruits. 90510.18 (W) Albany Co., WY, 7400ft, 2255m. 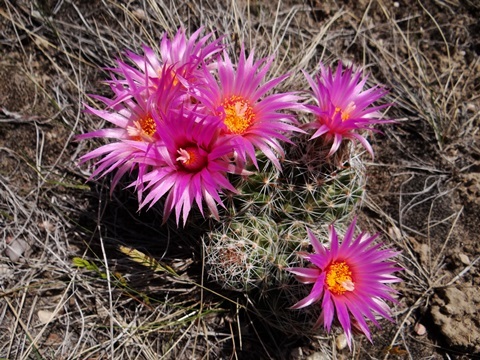 Tubercled barrel cacti with rosy-violet chalices. Escobaria vivipara (red spine form) (10x5,Z5,P,L,3:4w) ............................................ 40 seeds / $3.50 90510.35 (W) Fremont Co., CO, 5700ft, 1738m. JRT1114 Single to semi-clumping stems with prominent dark-red spines. Nice hot pink flowers in the crown. Escobaria vivipara (15x5,Z5,P,L,3:4w) ......................................................................... 40 seeds / $3.00 90510.43 (W) Terrell Co., TX, 4200ft, 1280m. JRT4114 Cylindric stems with white-brown spines tipped red. Dark pink flowers. 90530.13 (W) Pueblo Co., CO, 4800ft, 1463m. JRT1111 Robust stems with an array of spines in red and white. Bright, frilly pink flowers in rings. Escobaria vivipara (Cactaceae) (30x10,Z4,P,L,3:4w) ................................................... 40 seeds / $3.00 90530.23 (W) Fremont Co., CO, 5300ft, 1616m. JRT1112 Giant stems with mostly white spines. Medium pink, frilly flowers. Escobaria vivipara (Cactaceae) (12x14,Z4,P,L,3:4w) ................................................... 40 seeds / $3.00 90530.31 (W) Mohave Co., AZ, 4500ft, 1372m. JRT8101 Giant cylindric stems with white, black-tipped spines. Bright, clear purple flowers in rings. 90530.48 (W) Otero Co., NM, 6500ft, 1982m. JRT5170 Single stems with white, semi-shaggy spines, faintly red-tipped. Nice frilly pink flowers. Escobaria vivipara (10x14,Z4,P,L,3:4w) ....................................................................... 30 seeds / $3.50 90530.65 Thompson cult., ex Coconino Co., AZ. TC034 Giant single stems with some white inner spines and covered with the blackest outer spines. Escobaria vivipara (Cactaceae) (18x5,Z5,P,L,3:4w) ........................................................ 40 seeds / $3.00 90530.88 (W) Pecos Co., TX. JRT4113 Tall cylindric stem with semi-tight brownish-red and white spines. Magenta-pink flowers. 90512.15 (W) Millard Co., UT, 6100ft, 1860m. Bright deep lavender-violet flowers on white-spined barrels, the central spines tipped black. On S-facing hills of limestone. Escobaria vivipara v. bisbeeana (10x12,Z7,P,L,2) ........................................................ 75 seeds / $2.50 10496.17 (W) Cochise Co., AZ, 4800ft, 1463m. Sumptuous flowers of deep pink shading to white in the throat. Escobaria vivipara v. bisbeeana (15x8,Z5,P,L,2) .......................................................... 40 seeds / $3.00 10496.22 Thompson cult., ex Gila Co., AZ. JRT035 Light green stems with thin dark spines. Lighter than usual pink flowers. 90511.18 (W) Yavapai Co., AZ, 4400ft, 1341m. Barrels are densely covered with white spines tipped black. Small apical flowers in various yellow, pink and peach shades. Fenestraria rhopalophylla (Aizoaceae) (4x10,Z9,P,L,1) ................................................. 50 seeds / $3.50 74361.02 Ex Thompson. Spreading mats of grayish-blue "baby toes" with semi-translucent windows. 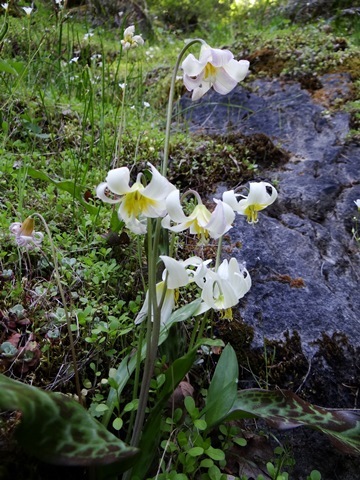 Inch-diameter flowers in yellow or white. Ferocactus acanthodes (Cactaceae) (90x40,Z5b,P,GL,2) ............................................ 30 seeds / $3.50 01211.05 Thompson cult. TC039 Giant single stems with time. Straw-yellow and pink spines with hooked centrals. Large yellow flowers ring the crown. Survived trials for 14 years outside to -20°F on south side bed protection. Ferocactus acanthodes ssp. 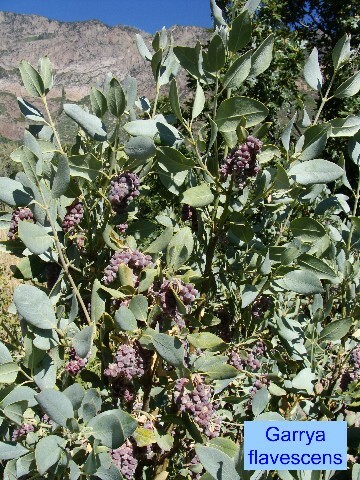 lecontei (90x40,Z6b,P,GL,2) ............................................ 40 seeds / $3.00 01210.12 (W) Mohave CO., AZ, 3000ft, 915m. JRT8701 Stems 1½ ft. round by 3½ ft. tall. Flat, vivid, pinkish-red, yellow and white spines in different combinations. Dark yellow flowers in rings. Ferocactus acanthodes X wislizenii (60x50,Z7,P,GL,2) ............................................... 40 seeds / $3.00 01212.01 Thompson cult. JRT040 Cross performed by Jeff Thompson in 2011. Progeny expected to have intermediate characteristics. Ferocactus emoryi X wislizenii (120X36,Z7,P,GL,2) ..................................................... 40 seeds / $3.50 25672.06 TC094 Large, single-stemmed "Candy Barrels" with narrow, rounded, partially-hooked spines and long, hairy, radial spines like F. wislizenii. 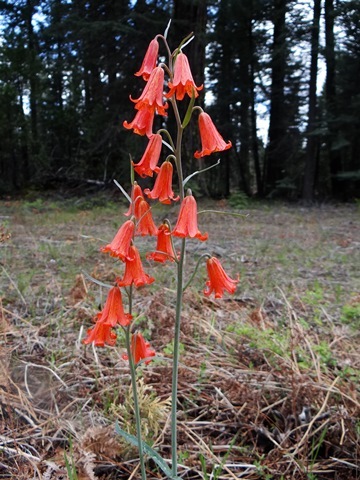 Prolific bloomer with bright red flowers like F. emoryi. 35097.17 (W) Pecos Co., TX, 4300ft, 1311m. JRT4401 Large barrels with about 15 ribs wrapped in very long, gray spines, the centrals recurved at the tip. Spines are reddish near the apex where large yellow, fragrant flowers are borne. Ferocactus sinuatus ssp. 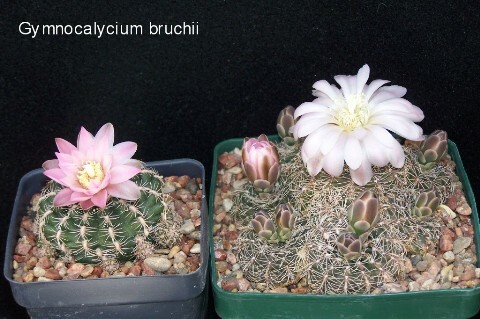 davisii (Cactaceae) (30x12,Z7,P,GL,2) ................................. 30 seeds / $3.00 76508.09 Ex TX (Thompson). JRT030 Bright green, ribbed barrels adorned with all yellow spines and hooked centrals. Large yellow flowers with red centers in late summer. 92526.19 (W) Gila Co., AZ, 4600ft, 1402m. JRT8705 Massive, squat barrels with heavy spines and hooked centrals. Large yellow flowers. Ferocactus wislizenii (Cactaceae) (90x24,Z8,P,GL,2) ................................................. 100 seeds / $3.50 92526.27 (W) Santa Cruz Co., AZ, 5000ft, 1524m. Massive, tall barrels with heavy spines and hooked centrals. Large yellow flowers in rings around the apex. Frasera fastigiata (Gentianaceae) (100x35,Z5,B,GL,4:12w) ........................................... 70 seeds / $3.50 30126.13 (W) Idaho Co., ID, 4800ft, 1463m. Columns of deep blue flowers over felted rosettes. 76707.38 (W) Park Co., WY, 9500ft, 2896m. Large rosettes of soft-green, furrowed leaves may take several years to reach flowering size but when they do, the enormous columns of hundreds of cream and green, fringed blossoms may stand four to six feet high. Monocarpic. Fraxinus anomala (Oleaceae) (200x150,Z5,P,C,4:8w) ................................................... 75 seeds / $3.50 05870.36 (W) Mesa Co., CO, 4850ft, 1480m. "Singleleaf Ash." Attractive, much-branched small tree with Ginkgo-like leaves. Fritillaria biflora (Liliaceae) (12x6,Z6,P,C,4:12w) ..................................................... 40 seeds / $5.00 10480.16 (W) Santa Barbara Co., CA, 3800ft, 1158m. 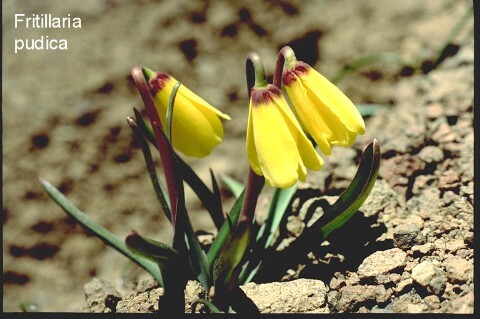 Over tufts of narrow leaves arise several pendant bells of greenish-yellow, often mottled and pencilled with brown. In serpentine grassland. 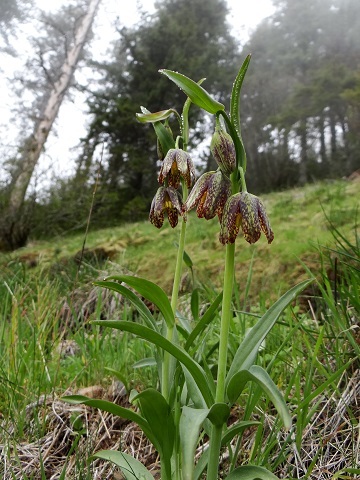 Fritillaria eastwoodiae (Liliaceae) (35x10,Z6,P,C,4:12w) ................................................. 50 seeds / $5.00 21267.14 (W) Shasta Co., CA, 3500ft, 1067m. Essentially a miniature version of F. recurva, both in plant height and flower size. 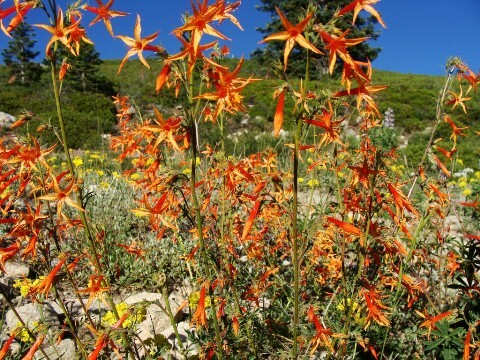 The pendant flowers are reddish-orange to orangish-yellow and are borne several per stem. Fritillaria lanceolata (Liliaceae) (14x9,Z5,P,C,3:12w) ..................................................... 40 seeds / $4.00 54108.12 (W) Jefferson Co., WA, 4800ft, 1463m. Mottled flowers in various shades of green, purple and yellow over smooth, narrow leaves. Dwarf form here on S-facing, eroding, volcanic cliffs. Fritillaria lanceolata (Liliaceae) (28x14,Z5,P,C,3:12w) .................................................... 40 seeds / $4.00 54108.23 (W) Benewah Co., ID, 2950ft, 900m. A larger form here with the usual mottled flowers in various shades of green and purple. Smooth, green, narrow leaves. 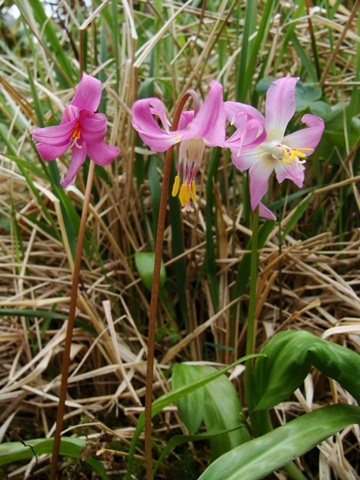 Grows here in open coniferous forests with Erythronium idahoense. Fritillaria pluriflora (12x12,Z6,P,C,3:12w) .................................................................... 30 seeds / $6.00 70553.27 (W) Lake Co., CA, 2225ft, 678m. 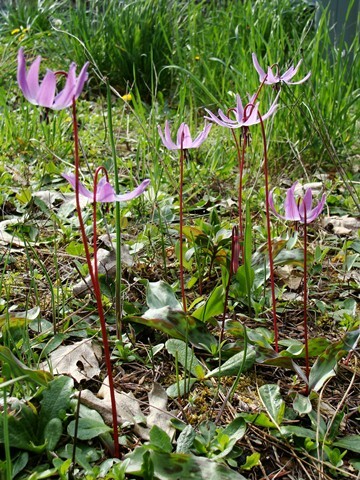 Startling pink-violet, bell-shaped flowers are lofted horizontally, several per stem, over basal clusters of elliptical leaves. Serpentine soils. Fritillaria recurva (Helena form) (40x12,Z6,P,C,4:12w) ............................................ 50 seeds / $5.00 74262.57 (W) Napa Co., CA, 1530ft, 467m. A dwarfer form here on the slopes of Mt. 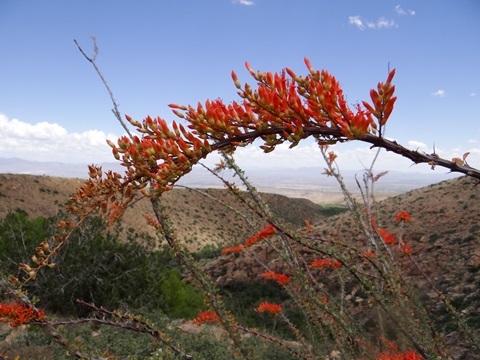 St. Helena with the same bright red flowers as the Sierran forms. Gaillardia aristata (Asteraceae) (12x10,Z4,P,C,1) ................................................... 60 seeds / $3.50 07453.16 (W) Rio Blanco Co., CO, 8500ft, 2691m. 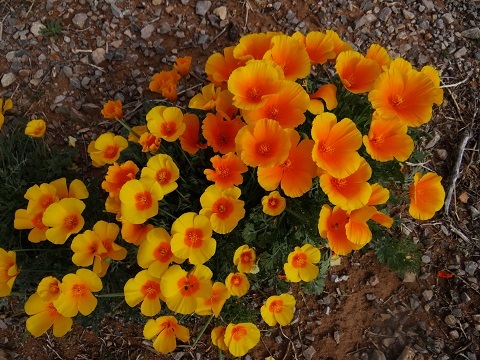 Tufts of rough oblanceolate leaves bear numerous yellow flowers with deeply-notched petals and orange centers. On white oil shale. Probably dwarfed here by the extreme conditions, my guess is that these plants will grow considerably larger under garden conditions. Gaillardia pulchella (Asteraceae) (40x25,A,C,1) …..................………………...................... 75 seeds / $2.50 70914.15 (W) Chaves Co., NM, 4500ft, 1372m. A very colorful and long-blooming annual with large flowers of cherry maroon at the center shading to orange and finally yellow at the notched tips. Garrya wrightii (Garryaceae) (180x130,Z6,P,C,3:12w) .............................................. 100 seeds / $3.50 92750.17 (W) Cochise Co., AZ, 5650ft, 1723m. Light, greenish-gray, evergreen, leathery leaves on shrubs which can easily exceed a person's height. Attractive pendant clusters of dark purplish-blue, almost black, berries. 09030.23 (W) Park Co., CO, 9900ft, 3018m. 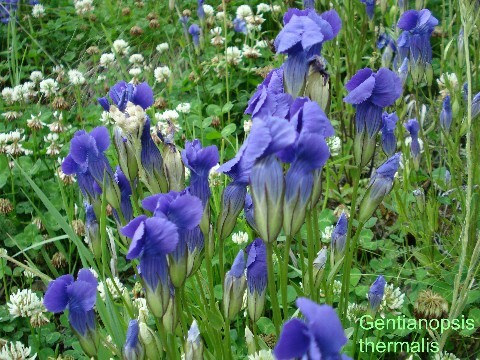 A robust and erect form with very deep blue flowers held high, as many as 20 to 30 per plant. Gentiana algida (Gentianaceae) (6x8,Z3,P,L,4:8w) ..................................................... 100 seeds / $3.50 11432.34 (W) Park Co., CO, 12800ft, 3902m. (= Gentianodes algida.) Light green leaves with creamy, translucent trumpets vertically striped dark purple. Late bloomer, just before the first snows. Gentiana andrewsii (Gentianaceae) (40x30,Z4,P,L,4:8w) ........................................ 100 seeds / $3.00 11815.16 Brilliant blue, bottle-like blossoms in whorls. 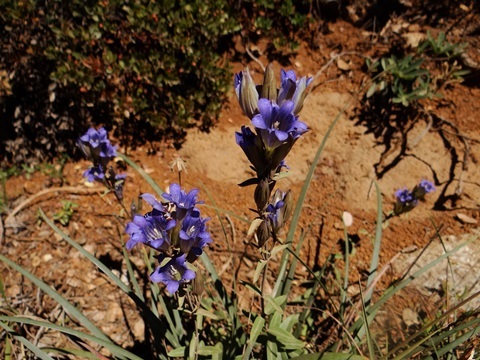 Gentiana asclepiadea (50x24,Z5,P,GL,3:8w) ................................................................ 100 seeds / $3.50 13612.02 Robust plants with lanceolate leaves and clusters of sessile deep blue flowers in the upper axils. 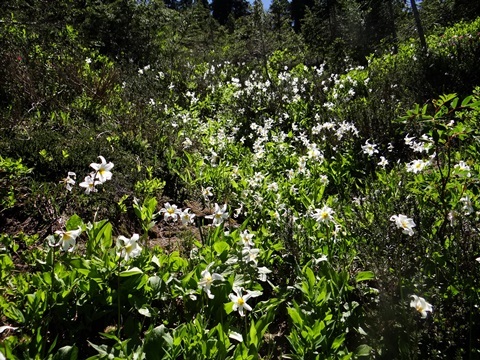 Gentiana asclepiadea f. alba (50x24,Z5,P,GL,3:8w) ................................................... 100 seeds / $3.50 13613.02 Robust plants with lanceolate leaves and clusters of sessile cream to white flowers in the upper axils. Gentiana asclepiadea f. rosea (50x24,Z5,P,GL,3:8w) ................................................. 100 seeds / $3.50 13614.02 Robust plants with lanceolate leaves and clusters of sessile rose to pink flowers in the upper axils. Gentiana lutea (110x65,Z5,P,L,3:8w) .............................................................................. 100 seeds / $3.50 54938.02 Large leafy clumps erupt into several spikes densely covered with yellow flower clusters. 70134.05 (W) Halda coll. Needle-like leaves and green-marked blue flowers about 2" long, appearing for several weeks in late summer. West Caucasus on limestone rocks. Gentiana parryi (18x12,Z3,P,L,3:8w) ....................................................................... 100 seeds / $4.00 70135.41 (W) Mesa Co., CO, 10300ft, 3140m. Extra robust form here on the Grand Mesa with multiple stems bearing terminal clusters of large deep blue flowers. 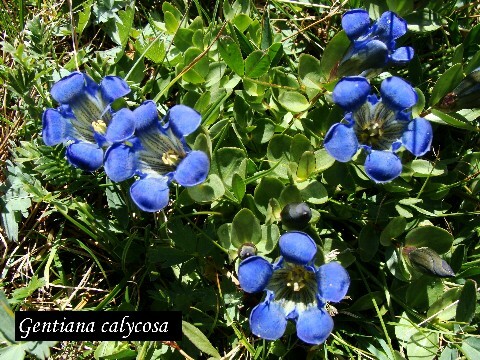 Gentiana sikokiana (Gentianaceae) (12x16,Z6,P,GL,1) .......................................... 100 seeds / $4.00 76512.00 Obovate leaves with rounded serrations bear blue, green-spotted funnel-flowers. Attractive Japanese species. Gentiana triflora v. montana f. alba (35x28,Z5,P,GL,3:8w) ...................................... 100 seeds / $3.50 78773.02 Tufts of lanceolate leaves from creeping rhizomes produce several stems with interrupted whorls of deep blue tubular flowers. Siberia. 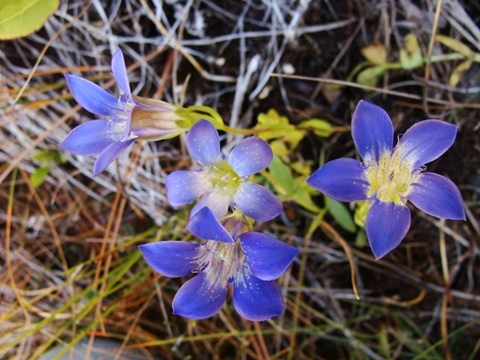 Gentianopsis detonsa v. elegans (15x7,Z4,B/P,L,3:8w) ............................................... 100 seeds / $3.50 15339.12 (W) Park Co., WY, 6600ft, 2012m. 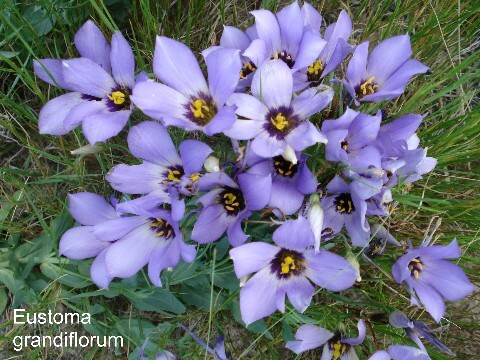 Somewhat dwarfer than G. thermalis and exhibits lighter colored flowers of blue to deep lavender shades. Edges of marshlands. 78360.17 (W) Mineral Co., CO, 9650ft, 2942m. Beautiful dark blue, deeply-fringed flowers on long peduncles. 09234.23 (W) Park Co., CO, 9800ft, 2988m. 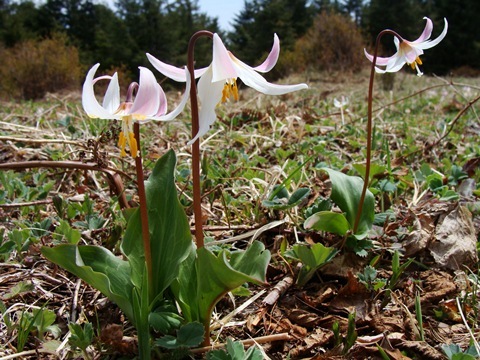 Trumpets of pale to deep pink, including salmon-pink. Gilia aggregata (red) (Polemoniaceae) (30x12,Z3,B,L,3:6w) ........................................ 55 seeds / $3.00 09232.14 (W) Gunnison Co., CO, 9900ft, 3018m. The beautiful scarlet-orange form. 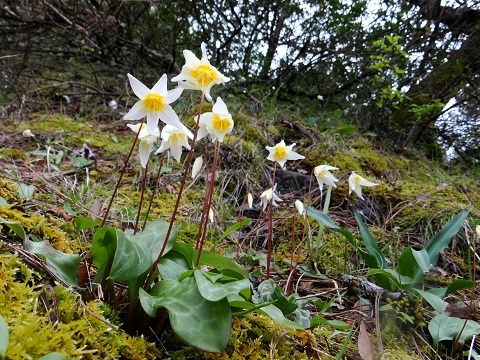 Dwarf plants here growing on south-facing mountain slopes of rocky loam. Gilia aggregata (white) (Polemoniaceae) (45x12,Z4,B,L,3:6w) ................................... 90 seeds / $3.50 09236.23 (W) Boulder Co., CO, 8525ft, 2600m. White to pale pink flowers in this population. 09237.10 (W) Carbon Co., WY, 9000ft, 2744m. Extra long corolla tubes in lovely pale orchid-pinks. 09237.21 (W) Iron Co., UT, 9400ft, 2866m. A deeper, more luminous fuchsia color here. 76788.17 (W) Uintah Co., UT, 5500ft, 1675m. Beautiful filigreed rosettes, one to several dense racemes of pure white flowers with exserted stamens. Worthy of cultivation. On sandstone ledges. Goodyera oblongifolia (Orchidaceae) (20x14,Z4,P,L,7) ........................................... 1000 seeds / $3.50 67054.13 (W) Kittitas Co., WA, 4300ft, 1311m. Oblong leaves attractively patterned with white or gray-green veins. Spikes of small white flowers. 12609.08 (W) ex Mex. A caudex-forming species with succulent, oblanceolate leaves and deep pink flowers. Of easiest culture, nearly everblooming. Grayia spinosa (Chenopodiaceae) (90x90,Z5,P,L,3:6w) ................................................ 100 seeds / $3.50 76712.20 (W) Utah. Small bushes with linear leaves and persistant woody spines. 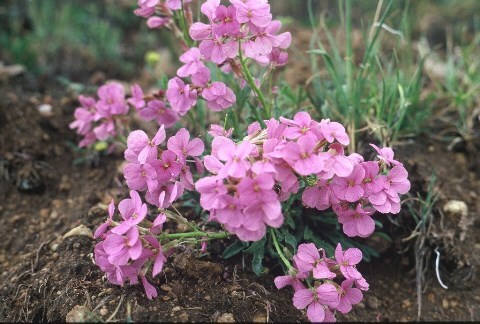 The tiny flowers appear in mid-spring and are surrounded by large reddish bracts. Haplopappus acaulis (Asteraceae) (5x12,Z4,P,C,1) .................................................... 50 seeds / $3.50 01217.21 (W) Mono Co., CA, 11400ft, 3476m. (=Stenotus acaulis.) 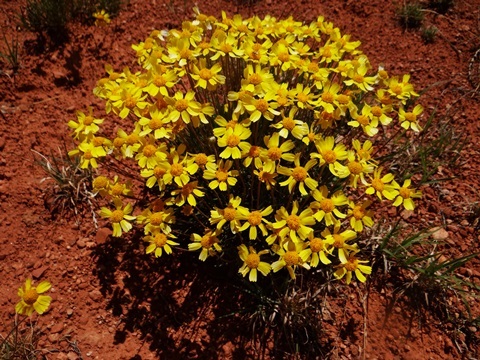 Prickly mats of sharp-tipped leaves produce many golden daisies on short stems in late spring. 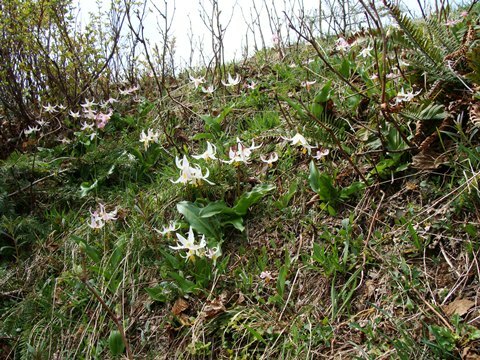 This population growing on gentle, E-facing slopes of dolomitic rubble. Haplopappus stenophyllus (Asteraceae) (8x14,Z6,P,L,2) .............................................. 40 seeds / $3.50 76789.32 (W) Yakima Co., WA, 3550ft, 1082m. Acicular gray-green leaves and myriad yellow flowers. On basalt scablands. 32563.17 Ex Chile. 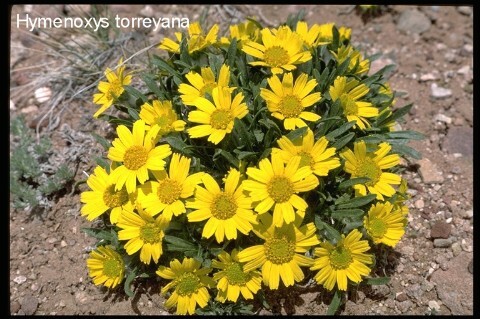 Low shrubs with spatulate, toothed leaves bear 1" yellow daisy-flowers on long peduncles all summer until frost. 12124.09 A vigorous grower forming mats of hatchet-shaped leaves. 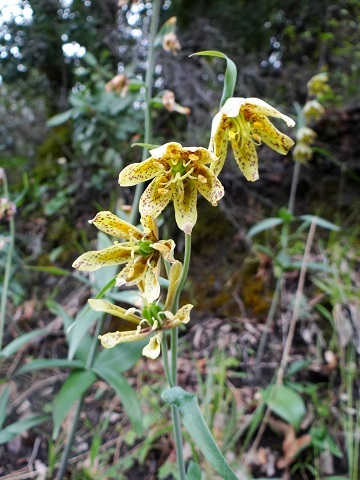 The nocturnal, yellow flowers are held over the foliage on 3" stems. Hesperaloe parviflora (Agavaceae) (120x70,Z8,P,C,2) ................................................. 40 seeds / $3.50 70145.04 Ex Bernalillo landscape plantings. 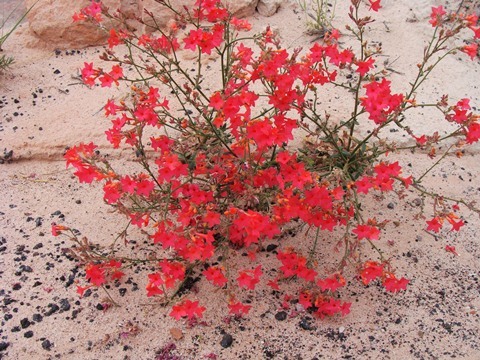 Fleshy, pendant, tubular flowers of coral-red on branching spikes from clumps of narrow, Yucca-like foliage. Heuchera hallii (Saxifragaceae) (20x20,Z4,P,L,1) ............................................................... 100 seeds / $3.50 35124.28 (W) El Paso Co., CO, 9025ft, 2752m. Scalloped leaves in a dense mass of rosettes bear campanulate cream flowers on several racemes. A most elegant plant. Found on west-facing granitic ledges and cliffs. 70146.17 (W) Lake Co., CO, 12800ft, 3900m. 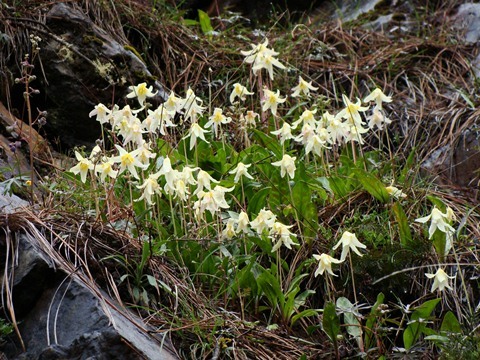 The dwarf, alpine form. Numerous spikes of small, white, campanulate flowers. 70924.37 (W) Bernalillo Co., NM, 10400ft Dwarf rhizomes creep through limestone cracks and bear short spikes of pink to burgundy-colored, hairy bells. 74881.17 (W) Lincoln Co., NM, 10000ft, 3050m. Broad vigorous mounds of foliage sprout a dense forest of panicles packed with beautiful pale pink and burgundy fringed bells. 01234.15 (W) Jeff Davis Co., TX, 6050ft, 1845m. Cushions of needles covered with masses of lavender stars. 58129.15 (W) Siskiyou Co., CA, 8900ft, 2713m. 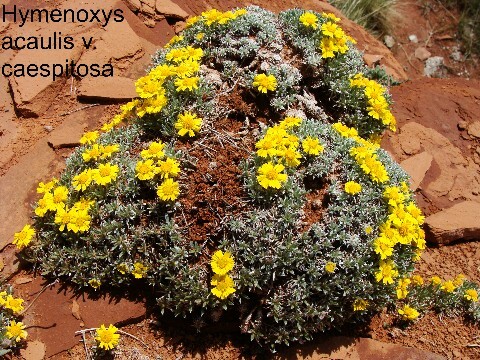 Numerous yellow flowers on viscid mats denser and more compact than H. algida. On W-facing volcanic screes. Hymenoxys acaulis (Asteraceae) (10x9,Z4,P,L,1) ................................................... 60 seeds / $3.50 01214.26 (W) Rio Blanco Co., CO, 8500ft, 2591m. 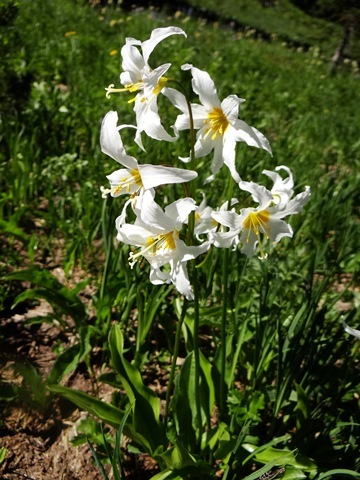 I was delighted to find whole fields of this plant growing on high-altitude plateaus of white oil shale. Yellow daisies on 2 to 4 inch scapes from tufts of green, spatulate leaves, somewhat woolly basally. 01216.27 (W) Montezuma Co., CO, 5900ft, 1800m. Leafy tufts produce branching scapes bearing large yellow daisy flowers. 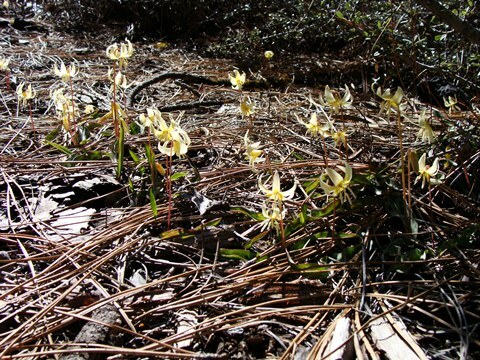 14432.15 (W) Torrance Co., NM, 6500ft Mats of spoon-shaped silver leaves erupt with yellow flowers. 76880.15 (W) Coconino Co., AZ, 6100ft, 1860m. Intensely-silver, dissected rosettes of long, narrow leaves bear hundreds of yellow daisies on a multiply-branched inflorescence. On sandstone fields. Hypericum cerastoides (Guttiferae) (10x30,Z5,P,L,3:8w) ............................................ 60 seeds / $4.00 12344.16 (W) Pirin, 6230ft, 1900m, Bulgaria. (= H. rhodoppeum.) Mat forming perennial of gray, pubescent, ovate leaves bears a profusion of inch-wide yellow flowers during the summer. Found on acid soils. Hyptis emoryi (Lamiaceae) (120x120,Z8,P,L,2) ......................................................... 100 seeds / $4.00 25674.17 (W) San Diego Co., CA, 1780ft, 543m. 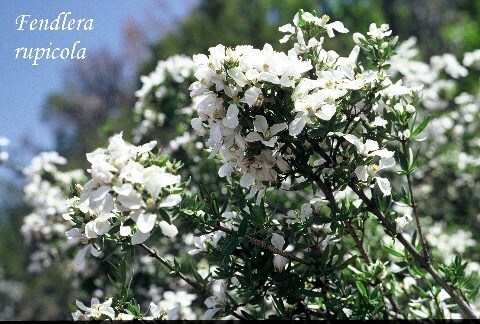 Attractive, silvery-looking bushes on account of the soft, fine hairs covering the toothed leaves. 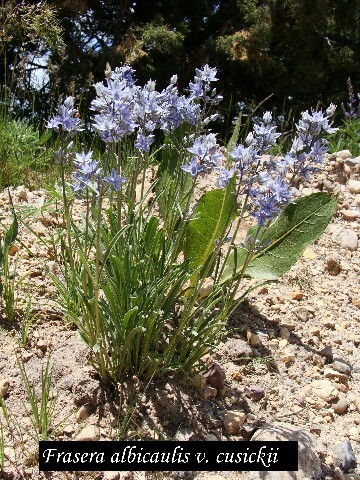 Covered with spikes of small silvery-blue flowers after periods of rain, usually in the spring. 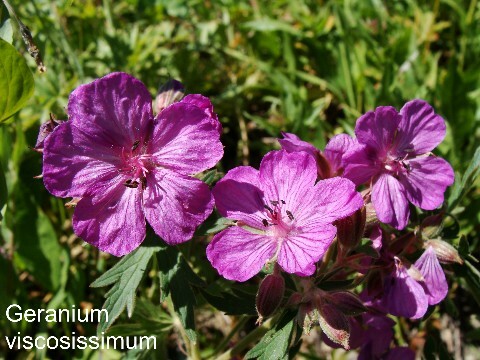 Whole plant emits a resinous-lavender odor.